Manufacturer of a wide range of products which include single sided foam tape, self adhesive foam tape, epdm foam tape, neoprene foam tape, single side white eva crossline foam tape and foam tapes. Single Sided Foam Tape is made with single or double-sided adhesive coating to meet the customer's requirements. We are applying acrylic or rubber base Pressure sensitive adhesive on EVA, PE, PU, Nitrile (PVC-NBR), EPDM, Neoprene, PVC foams and put the release paper or release film on it. Single side foam tapes are made with many kinds of foams coated with acrylic or rubber adhesive. These foam tapes are made in all thickness as per request of users. These foam tapes have different density and temperature resistance as per the foam characteristics. Double sided foam tapes made with medium density cross-linked PE/EVA foam or acrylic foam as a base material and high-performance adhesive coating on both the side by giving the release paper or film. 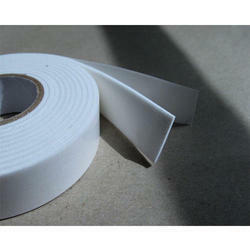 This tape is made with different thickness (0.4mm - 15mm) of foam as per the application and specification of customers. Single sided foam tapes are used as gaskets, seals or heat or cold insulation in HVAC, automobile, refrigerator, air-conditioner, electronics appliance and electrical panel industries. Special rubber and PU foams are used as ant vibration and sound dampeners in electrical and electronic industries. Our organization is engaged in offering a wide range of Self Self Adhesive Foam Tape, which is manufactured using superior quality raw material for ensuring its durability at the users end. These self adhesive foam tapes are commonly used for mounting purpose. Apart from this, these foam tapes is used for the cushion mounting on the LPG pipe lines. We are offering these tapes in various lengths, widths and colors to meet the exact requirement of the clients. 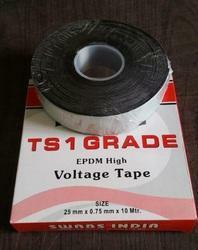 Our domain expertise enables us to offer an excellent collection of EPDM Foam Tape. Offered foam tapes are available in different designs & sizes for fulfilling the diverse requirements of our clients. Our experts utilize best grade raw material for designing these tapes, making them widely demanded in the market. Further, these foam tapes are tested on various quality parameters by our experts. We are a leading and prominent manufacturer and supplier of a broad variety of Neoprene Foam Tape. Available in varied lengths and designs, this foam tape finds application in packaging industry. The offered foam tape is designed and manufactured in adherence to set industry standards and is available at competitive prices. Further, this tape is tested on stringent parameters in order to ensure its flawlessness. As a predominant market leader we are energetically occupied with furnishing our regarded customers with an elite exhibit of Single Side White Eva Crossline Foam Tape. For supplying an immaculate reach, the offered product is checked by our quality controllers. Our specialists additionally utilize the prevalent innovation and material for outlining these products. We give the range to our customer at most sensible cost. Our array of Crosslinked Eva foam is all around acclaimed for features that too at reasonable cost. We are reckoned as one of the prominent Single Sided & Double Sided Foam Tapes Manufacturers, Exporters and Suppliers based in India. The Acrylic Foam Tapes offered by us are coated on both the sides with solvent or water based acrylic or hot-melt adhesive. These Foam Tapes are also laminated with release papers. The Polyurethane Foam Tapes are widely demanded in the market due to excellent strength, good bonding properties and resistance to solvents, heat & chemicals. We are applying acrylic or rubber base Pressure sensitive adhesive on EVA, PE, PU, Nitrile (PVC-NBR), EPDM, Neoprene, PVC foams and put the release paper or release film on it. Single side foam tapes are made with many kinds of foams coated with acrylic or rubber adhesive. This foam tapes are made in all thickness as per request of users. This foam tapes has different density and temperature resistance as per the foam characteristics. Double sided foam tapes made with medium density cross-linked PE/EVA foam or acrylic foam as base material and high performance adhesive coating on both the side by giving the release paper or film. 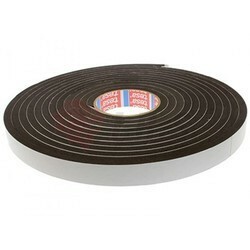 This tape is made with different thickness (0.4mm - 15mm) of foam as per the application and specification of customers. For Mounting Nameplates, Metal / Polycarbonate Stickers, etc. Focused on technological up-gradation, dynamism and innovation, we are moving ahead by maintaining timeliness in delivering a wide gamut of Single Side Eva Crossline Foam Tape. 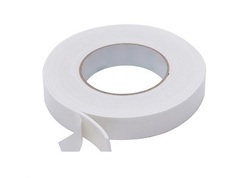 This foam tape uses as gaskets, seals or heat or cold insulation in HVAC, automobile and electrical panel industries. 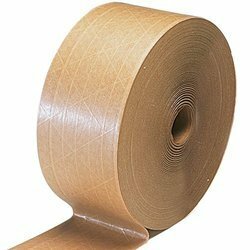 Our foam tape is manufactured from the top quality material & contemporary techniques as per the set industry norms. The offered foam tape is available in number for sizes & thickness to meet the needs of the patrons.